Disorder and Floating are included on one DVD. Huang Weikai's one-of-a-kind news documentary captures, with remarkable freedom, the anarchy, violence, and seething anxiety animating China's major cities today. As urbanization in China advances at a breakneck pace, Chinese cities teeter on the brink of mayhem. One man dances in the middle of traffic while another attempts to jump from a bridge before dozens of onlookers. 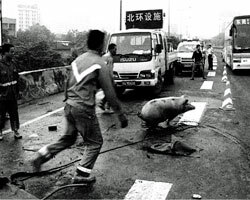 Pigs run wild on a highway while dignitaries swim in a polluted river. Unshowable on China's heavily controlled television networks, Disorder reveals an emerging underground media, one that has the potential to truly capture the ground-level upheaval of Chinese society. Huang Weikai collects footage from a dozen amateur videographers and weaves them into a unique symphony of urban social dysfunction. Huang shatters and reconstructs a world that's barely comprehensible, though with palpable energy - vibrant, dangerous, and terrifying. According to revolutionary Danish architect and urban planner Jan Gehl, if we are to make cities sustainable and livable for people, we must re-imagine the very foundations of modern urban planning.